If you like Chinese food, check out Chen Chinese Cuisine restaurant in Lake in the Hills, McHenry County. This stand alone site which was once a Bakers Square restaurant has been completely remodeled. 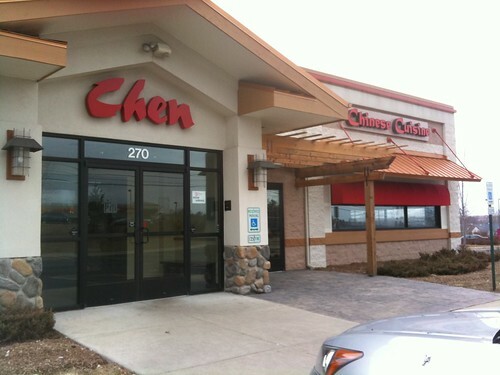 If the Chen name sounds familiar, you may have been to Chen’s original location which was in a strip mall across Randall Road for the past 8 years. The original restaurant, opened 16 years ago, is in Crystal Lake. Throughout our meal we could hear the soothing sounds of the water sculpture in the front entry way. Large windows surround the dining area which is bisected by the bar area. Black lacquered tables and warm brown and red colors complete the atmosphere. Our meal began with a pot of tea. We choose green tea; Oolong and jasmine tea are also available. We ordered from the large lunch time specials menu. 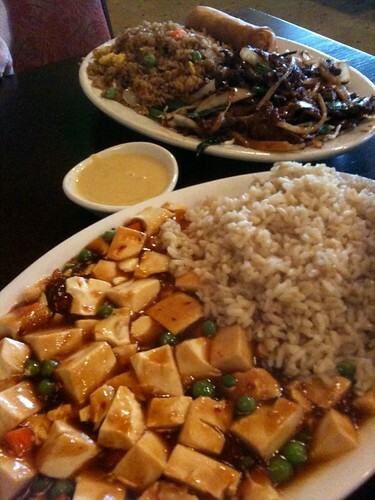 I had the vegetarian Ma Po Tofu, soft tofu with peas, carrots, dried pepper flakes in a brown sauce. Noel F. Williams had the Mongolian Beef, with beef, white and green onions in a somewhat sweet sauce served over a bed of rice noodles. Noel asked for his meal to be prepared spicy and the dish was not as hot as he would have liked. Lunch specials come with crisp, fried vegetarian spring rolls and rice. Jasmine rice is served though brown and friend rice are available upon request. We also order soup with our lunch. Noel had a bowl of the egg drop soup. I ordered the vegetable soup with tofu, mushrooms and broccoli in vegetarian broth. My soup came in a large serving bowl with a ladle which I used to fill my bowl. At the end of our meal the bill was served with a couple of traditional fortune cookies. Chen Chinese Cuisine is open daily.